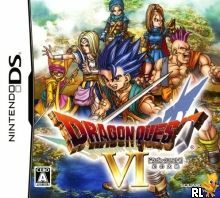 OverviewDragon Quest VI: Realms of Revelation is the last in the Zenithia Trilogy of Dragon Quest remakes for the Nintendo DS. This was the first time in little over 15 years that Dragon Quest VI has made it to the United States in any form from the original Japanese SC. 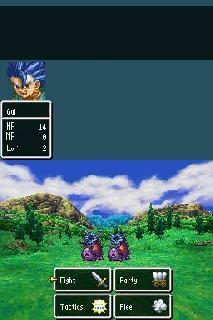 Dragon Quest VI: Realms of Revelation for Nintendo DS brings the classic console title into the handheld scene. Explore two parallel worlds while distinguishing reality from illusion and seeking to discover the true meaning of your very existence. Now you can add videos, screenshots, or other images (cover scans, disc scans, etc.) for Dragon Quest VI - Maboroshi no Daichi (JP)(STORMAN) to Emuparadise. Do it now! If you haven't noticed yet, we have a retro game of the day feature (top-right of the screen) wherein we feature a new retro title every single day! Now, you can vote for your favorite games and allow them to have their moment of glory. 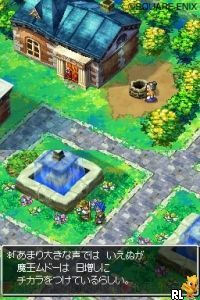 Click on the button below to nominate Dragon Quest VI - Maboroshi no Daichi (JP)(STORMAN) for Retro Game of the Day.